After all that daily drag, sometimes you just shake your head, look up in the air, and think about how nice it would be to become queen, even if just for a day. You could have a servant for your every need. You would have someone to help you get dressed, put on your makeup, make your breakfast, feed you breakfast, and even carry you around town! Then you remember that queens also must listen to all the problems of their subjects all day long, and figure out how to solve them. Then there’s all the wars to wage, and the clothes aren’t always the most comfortable to wear… Maybe being queen would be awesome for just a day or two at a time. When you wear this Deluxe Red Queen Crown don't be surprised if random people come up to you and say, "I am at your service, my queen!" It looks so genuine that people can't help but want to be your loyal subjects. 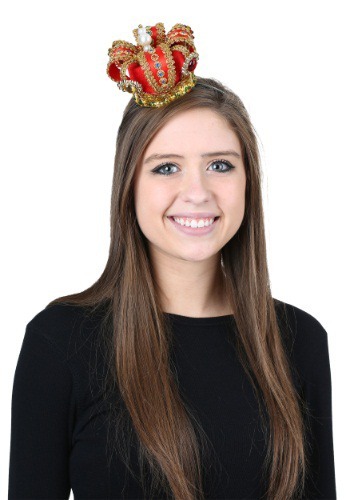 Wear it with your Red Queen costume or any regal costume and become royalty for the night. Crown is cute but headband glued in flimsy and won't support crown. Cheaply made. Partially headband best I could and will attempt to use a pin in system. Hopefully can figure something out.